New! 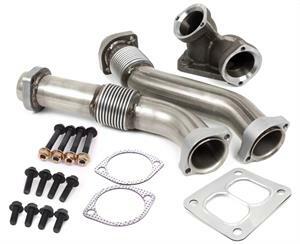 This Dieselsite (now in 409 Stainless Steel) up-pipe kit was designed to replace the poorly designed OEM standard equipment up-pipes and donut gaskets that typically leak. This design allows for expansion and contraction without stressing the actual gasket and is a direct replacement for all 1994-1997 Ford 7.3L with no modifications needed. All gaskets, bolts and hardware are included.